For most of my academic career I felt like I was treading water -- maintaining until I encountered some worthwhile pursuit that actually appealed to me. Now, with law school graduation looming large on the horizon, I have finally found something I care about: food policy. Whether I will be able to apply this interest to any real-world, salary-earning career is less clear, but I have been relieved to find that I have the enthusiasm to read books, scholarly articles, popular media pieces, and even legislative acts about food without losing interest. Inevitably, my growing passion for responsibly produced food has had a pretty dramatic impact on our diet. I've become especially selective about the meat, poultry, and eggs we buy; I usually purchase chicken from Harr Farms at the Soulard Farmer's Market (antibiotic-free, cage-free, and reasonably priced, yay!). Part of what has allowed us to improve our eating is finding better ways to prepare at-home versions of the processed foods we would normally eat, like chicken tenders. 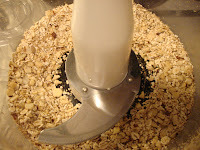 I did not toast the almonds or barley flakes before grinding them. I put all of the ingredients in the food processor and pulsed them together until the coating was the consistency I wanted (mostly fine with a few larger pieces of almond left). Then I poured the coating in a shallow bowl. In a second bowl, I whisked an egg, a splash of water, and a few dashes of hot sauce. From two large chicken breasts I cut 12 chicken fingers. I preheated the oven to 375 and lined a large, rimmed baking sheet with aluminum foil. Then I placed a wire rack over the baking sheet. 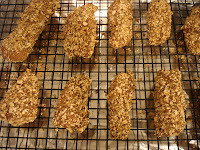 When all of the prep work was done, I coated the strips with the egg mixture first, then with the crumb coating. When they were thoroughly coated, I placed the chicken pieces on the wire rack. I put the smallest dab of butter on each strip before sliding the sheet pan into the oven, but you could certainly skip the butter altogether. The strips baked for about 25 minutes, but the time would ultimately depend on the thickness of the chicken pieces. 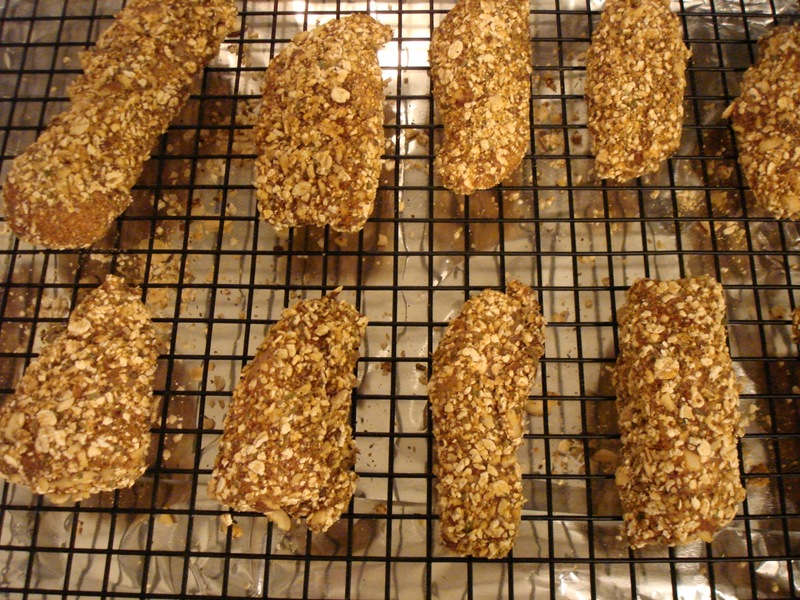 Cooking the chicken tenders on a rack avoids the gummy, soggy crust that sometimes forms on breaded items while they bake. It also ensures that you don't leave half of that yummy coating behind on the pan. When the strips were done, I piled them up on a plate with our favorite barbeque sauce from a local restaurant (no high fructose corn syrup) and dinner was served! The crust was well-seasoned and a bit chewy from the barley flakes. The variations here could be endless. In lieu of barley, I'm sure you could use oats, or pecans instead of almonds; the seasonings could be adjusted to suit individual tastes. Serve them with homemade honey-mustard or ketchup. 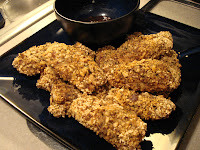 Also, I made chicken strips but this would be a great way to make smaller chicken nuggets for kids. You could even make them in advance to freeze (but only if the chicken has not been frozen previously). I hope you will give these easy strips a try. They are significantly cheaper (I figured about $6.75 for 12 strips) than the restaurant equivalent and I would guess that they are also significantly more healthy. If you come up with any interesting coating combinations, feel free to comment. Be creative and enjoy!